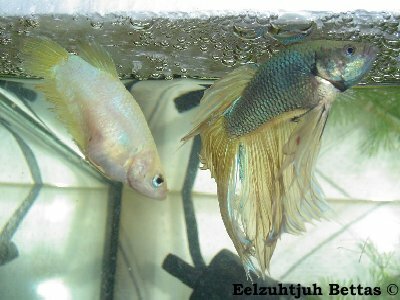 After you decided which pair you will use for breeding and both fish are in optimal spawning condition we introduce the pair in the spawning tank. I personally always introduce the female first to the breeding tank in order to get familiar with the new environment and the possible hiding places. Two days later the female is put in the chimney (I always use a platstiuc cola bottle from this the top and bottom are cut).. At first, there will be a lot of flaring and showing from both male and female. The vertical striping in darkbodies females is a sign that she is willing to spawn (keep in mind this striping can not be observed in lightbodied females). 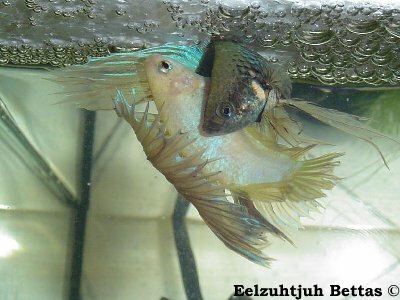 They are left like this for 1-2 days, in order to give the male some time to build a bubblenest. The egg production in the female will also be further triggered. I only feed the pair as long as the female is still in the chimney. 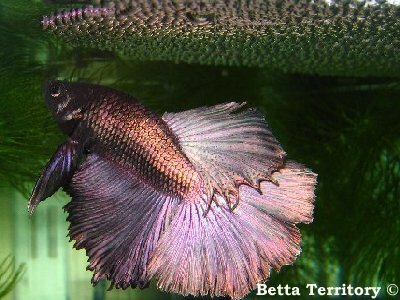 Most females are still feeding themselves but too my experience some males will not eat during the process of building a bubblenest. I usually release the female about 5-10 minutes before the lights go off in my fishroom. 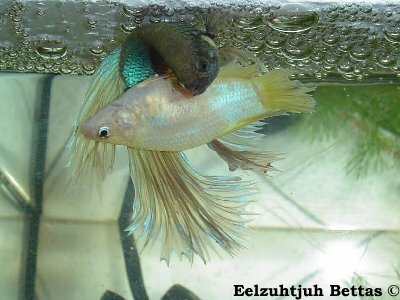 I always want my fish to respond on each other immediatly after release. When the female does not react on the male or is affraid of the male, she is removed to give it another try after a few days/weeks. After the release the pair will flare and show around to each other which is mostly followed by the male chasing the female through the tank. It is quite normal that the female takes a few bites during this process. 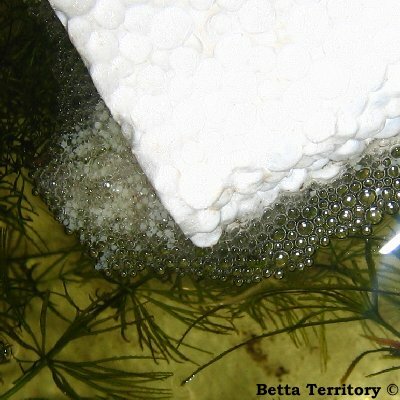 After a while the female will observe the males actions under the bubblenest from a safe distance. When the male is ready he will hang under his nest and will regularly swim off looking for the female. 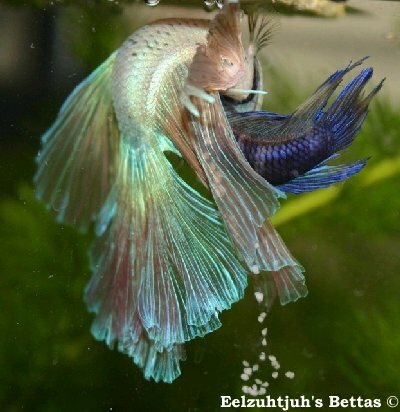 He will try to convince her to come under the nest on a less aggresive way by flaring his fins. When the female is ready for spawning she will approach the male with her head down. They will start turning pushing each other in the flank. Eventually the male will start embracing the female. Sometimes it will take a while before the male gets the hang of it, especially when it is a inexperienced male. During the embrace the eggs will be pressed out of the female. Simultaniously the male will release his sperm which fertilize the eggs. 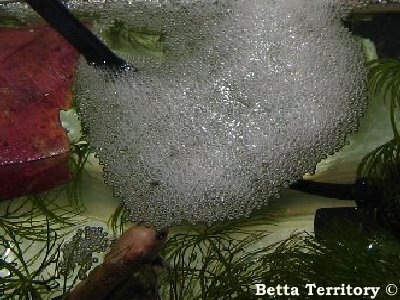 The eggs will fall down and usually both the male and female will swim down to collect the eggs and to blow them into the bubblenest. 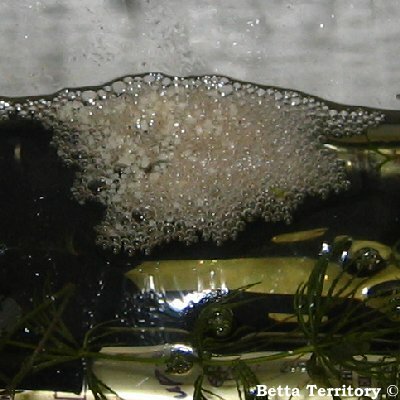 The actual spawning process can vary from half an hour to >3 hour. When the male had enough he will chase the female off and she will hide again in the plants. This is the time to remove the female in order to recover. The male will now take care of the nest on its own by taking the eggs in his mounth and reordering them in the nest. 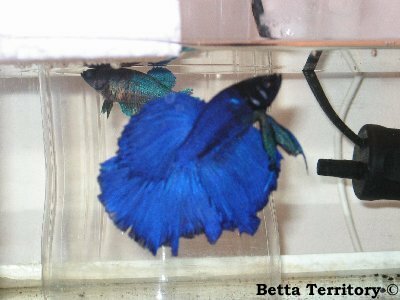 It sometimes even happens that a male decides to move the entire nest to another place in the tank. From now it is important to leave the light on for 24h a day untill the youngsters are in the free-swimming stage and the male is removed. When you use this closely observed spawning method you will seldom have females which are heavily damaged. Most of the time the females will leave the spawning tank in good health and condition. If the female does get damaged, with good care, this will recover within a few weeks.